Ships 5-7 business days after proof approval. We deboss your logo on the front of this black leather wine tote bag, to help you create the business appreciation gift. The tall, smooth front surface is perfect for large or detailed logos. 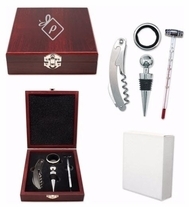 The wine bottle is held securely inside by a Velcro strap, until you are ready to give it to your employees, clients, key accounts, managers and board members. A classy way to dress up a bottle when giving wine to a client or board member gift.